The music world is full of figures that burst onto the scene explosively, only to peter away a short time later. The same can't be said of Alicia Keys, Beyonce or Rihanna, all of who have proven beyond doubt that they have what it takes to make lasting, impressionable music that sells. In this comparison article, we take a look at the brilliant careers of these remarkable artists. Alicia Keys was born Alicia Augello Cook on January 25, 1981. She is a recording artist, musician and sometime actress based in the United States and grew up in Hell's Kitchen in New York City. She started playing piano at a very early age, and later attended Professional Performing Arts School where she graduated as valedictorian. Although she later went on to attend Columbia University, she would drop out to enter the music business. Beyonce was born Beyoncé Giselle Knowles on September 4, 1981. She is a singer, songwriter, actress and she has dabbled in fashion as well as a designer. Knowles grew up in Houston, Texas where she attended several performing arts schools. She first achieved fame as a member of Destiny's Child, although would later pursue a successful solo career. Rihanna was born Robyn Rihanna Fenty on February 20, 1988. Born in Barbados, the recording artist and songwriter later moved to the United States where she entered the music business. Alicia Keys launched a massively successful debut album titled Songs in A Minor, which went on to sell more than 12 million copies all over the world. Keys was awarded the best-selling new artist and best-selling R&B artist awards in 2001. And her debut album earned her five Grammy Awards. 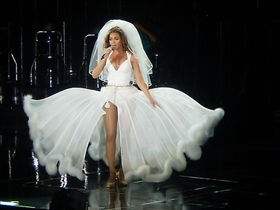 Beyonce made her solo debut during a break in Destiny's Child schedule. Entitled Dangerously in Love, the album was a huge success, earning Knowles five Grammy Awards. Rihanna was also successful with her debut album entitled Music of the Sun, and this landed her in the top ten spot of the Billboard 200 chart. Alicia Keys has made numerous appearances on various television series, among them Charmed. She has also appeared in a few films, most notably Smokin' Aces and The Nanny Diaries. Beyonce Knowles has had a bit of success as an actor as well, having first appeared in Carmen: A Hip Hopera. 2006 saw her starring in Dreamgirls, which was based on the Broadway play of the same name. Knowles also has a fashion line that she launched with her family called House of Deréon. Rihanna has made a number of lucrative endorsement deals, among them with Secret Body Spray, Nike sportswear, Clinique and female deodorant Secret. More recently, Rihanna became an endorser for Gucci's Tattoo Heart Collection. Which superstars shot to fame quickest?